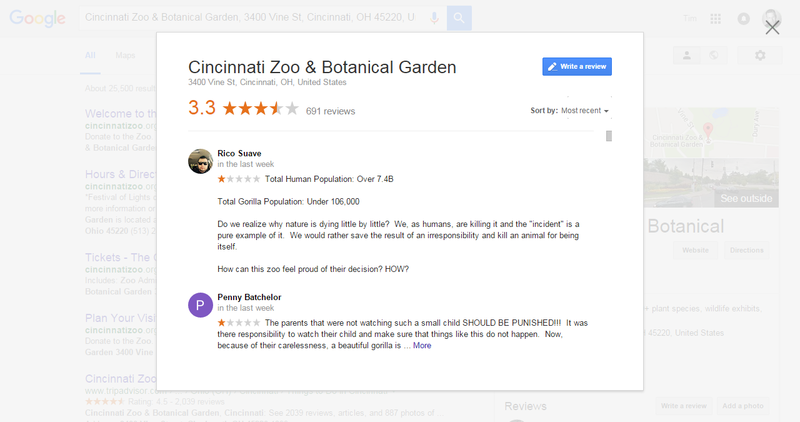 After the tragic events at Cincinnati Zoo there has been an outpouring of grief and anger, naturally this has led to negative reviews being places on the Cincinnati Zoo’s Google business page. Over the past week there have been hundreds of negative 1 star reviews left on the Google business page, so where is the Google My Business review bot doing about them ….. well nothing, actually! The sheer scale of reviews ( 90% negative ) should have sent alert to someone! I have reported to the Google My Business team, but you are still able to view the reviews at the moment.